The ECSC scheduled rally to Keyhaven was blighted by bad weather. So, your correspondent went the following week to check out what you might have expected from a visit. The prerequisites of a visit to Keyhaven are fine weather, lots of west in the wind and a dinghy. There are three possibilities for a stopover. Two anchorages or picking up a temporarily vacant mooring in the main channel. There is one anchorage outside the Keyhaven spit and one just inside the entrance to the channel. The one outside has good holding and bags of room. Go as close in as you feel is practicable. The further out you are the greater the potential for rolling in anything more than a force 3. The anchorage inside the spit, in the words of a Keyhaven ferry skipper, is “a place you wouldn’t want to be in a south-westerly 5”. Gina left her pontoon in East Cowes at 0810 and arrived off Keyhaven spit at 1010 making the most of the tide and wind. We pumped up the dinghy, mounted the outboard and set off for the shingle at around 1230. 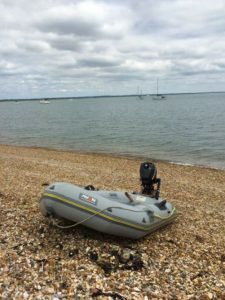 If you are anchored outside the spit at any distance from the shore, an outboard is advisable to overcome the 2 knot cross-current. We chose to lunch at the Keyhaven Yacht Club and to use the Keyhaven Ferry to get there. Three ferries were running so we didn’t have to queue for a long time at the jetty outside the entrance to the castle. It’s unusual to travel to Keyhaven from the castle on a return ticket. Most folks travel in the opposite direction. The chap selling tickets took a little convincing to part with returns. When we came back, we were regarded with suspicion boarding the ferry from Keyhaven. “Where did you get those (return tickets) from? I’ve never seen a return ticket at this end” said the gatekeeper. 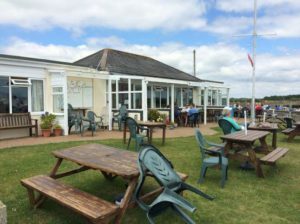 The Keyhaven Yacht Club is well appointed; the bar food excellent and the prices reasonable. The facilities (toilets and showers) are in such fine fettle that they must have been installed recently and are a credit to the club. Chatting at the bar, I did pick up two useful pointers: hats in the clubhouse “upset people” (oops) and dogs are not allowed in the club or the garden terrace. 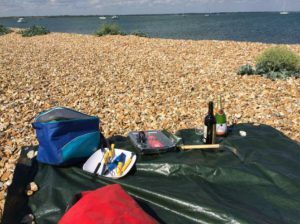 In the evening, we set up a BBQ on the shingle. The wind started to pick up but the sun was still slanting down. 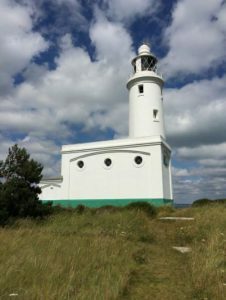 We plonked ourselves in the lee of the lighthouse. I decided to keep off the wine; eying Gina’s motion and being mindful of the return dinghy trip. Once we’d packed away and removed all evidence of our presence, we set off in the dinghy into the chop. Boarding Gina was interesting. 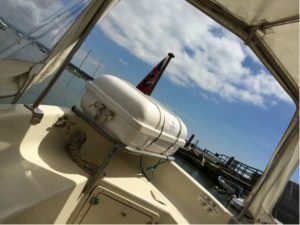 I tend to step off the dinghy thwart onto Gina’s cap rail, grab a stanchion and I’m aboard. My lady wife is less confident and likes to use a ladder. With the dinghy bouncing against the boat and the briny sloshing about, we needed a modified approach. I hopped aboard Gina; threw an extra line to my wife who secured it to the stern of the dinghy. I then walked the dinghy round the boat into the lee of the wind; and tied it off fore and aft. We use lifejackets with integral harnesses, so I was about to throw my wife a lifeline to clip on but instead I chose a 14mm warp, made bowline at the end and passed it to my wife to loop into her harness. The ladder (legs folded) was then hooked on to Gina between the boat and dinghy and my lady wife climbed aboard. We both slept soundly. I know the holding is good and anyway I’d set the anchor drag alarm on the plotter. Next morning was bright and calm. I did note that the soap dispenser had ended up in the sink. It must have been a bouncy night. Note to self: “must anchor closer-in next time”. After breakfast, we left as the tide turned at 1130 and were back in Cowes by 1330.